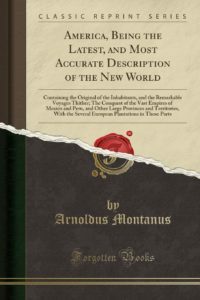 This book is largely a translation of Arnoldus Montanus’ work AMERICA: DE NIEUWE EN ONBEKENDE WEERELD published in Holland during the same year. 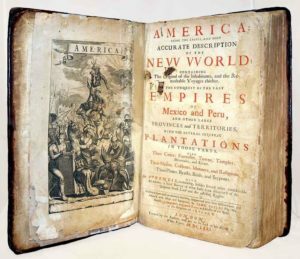 Ogilby made considerable additions however from other and more reliable sources in respect to New England, New France, Maryland, and Virginia, using primarily English resources. 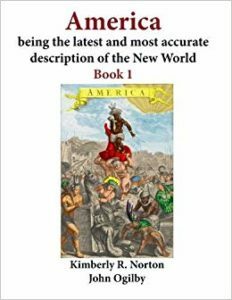 He has also added a short section on New Netherland, “now called New York’, which gives a detailed account of the transfer of sovereignty from the Dutch to the English in 1664. Like Montanus’s work, it is perhaps best to know for its amazing plates. Along with the city views are portraits of Columbus, Vesputius, Magellan, and others. There is also a pluthora of plates showing the many facets of Indian life, including games, festivals, occupations, habitations and religious rites and customs. 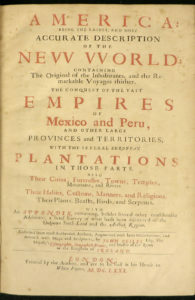 AMERICA was intended as a second title in Ogilby’s projected ENGLISH ATLAS series and is his best known geographical work along with the BRITANNIA atlas of 1675. 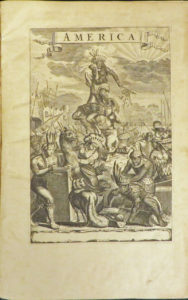 Not long after Alphonso de Pisa went with twenty-seven Men from Nombre de Dios to the same River Suerre, but ut being then very rough at the Entrance, he was necessitated to pass on to a small uninhabited isle, where while he lay at an Anchor, the Weather began to grow worse and worse; the Gusts of WInd, mixed with Showers of Rain, Thunder, and Lighting, seemed to threaten a general Destruction; for the Ship two Spaniards and one Moor were killed by the Lightnin.